SP-102 portable helipad lighting is ICAO compliant airfield lighting designed to operate in remote areas. LED optics generates correct light output in terms of intensity and chromaticity. SP-102 helipad light is powered by a standard deep-cycle battery which can be stored locally. SP-102 helipad FATO light is white, omni-directional aviation light is compliant with ICAO, Annex 14. It has NVG (Night Vision Goggles) mode which is often required by military customers. What distinguishes S4GA heliport lights from products of other helipad lighting suppliers is unique LED optics allowing to achieve the highest visibility range in its class – up to 10 km. It is critical for pilots when landing in adverse weather conditions like fog or heavy rain. Moreover, aluminium body and UV-resistant polycarbonate dome protect helipad light from deterioration. Portable lighting is a suitable solution for helipads located in remote, hard-to-reach places with hindered infrastructure access. If a given helipad carries out night operation, it has to be equipped with some lighting of certain facilities, including the FATO zone. Let’s describe the features of helipad FATO portable lighting. The FATO zone is the largest area marked at a helipad. The abbreviation refers to Final Approach and Takeoff area. The zone is designated with lines which create the shape of a square, rectangle or a circle. In turn, the TLOF area (Touchdown and Liftoff area) is located inside the FATO area and it also can be in the shape of a square, rectangle or a square. What requirements does helipad portable airport have to meet? The requirements regarding helipad FATO portable lights are determined by the ICAO (International Civil Aviation Organization). Additionally, if a given lighting system is used in the European Union, it must fulfill the following standards: EN 61000-4-2:2009, EN 61000-4-3:2007/A2:2011, PN-EN 61000-4-4:2013-05, EN 61000-4-5:2014-10 and EN 61000-4-6: 2014-04. Helipads that are meant to handle night flight operation must be equipped with proper lights. Even though not each and every helipad is equipped with a complete set of lights, the following facilities must be illuminated during night operations: the TLOF and FATO area, wind direction indicator, landing direction indicator and taxiway. Where is portable lighting used? As mentioned before, portable lighting is used in places that are hard to reach or lack in infrastructure. In such cases, solar portable lighting is a perfect solution. Charging the battery via a solar panel takes just 8 hours. 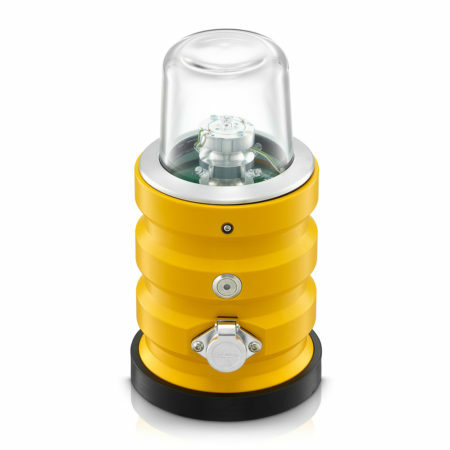 If needed, the lamps can also be charged with a charging station or by plugging-in to an electric network. What light is used to mark the FATO zone? The FATO zone is marked with white, omnidirectional lights. LED lightbulbs are used as they provide not only a long durability (50 000 hours!) but also the right, required by regulations intensity and chromaticity. How long does a fully-charged lamp work? The work time of a portable light depends on a set intensity. If a light uses a low intensity, it will work for 36 hours. High-intensity light diminishes the work time to 15 hours. Night Vision goggles compatibility mode. If a helicopter operates in low-visibility conditions (e.g. due to a heavy rain or fog), the range of the light visibility is a key factor. The most advanced systems give out a light that is visible from 10 kilometers from the air. Operating time in steady mode Min intensity 36 hrs.